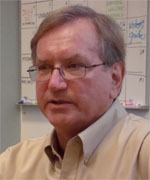 Brian Steffens is director of communications, Donald W. Reynolds Journalism Institute, at the University of Missouri. Steffens was previously executive director of the National Newspaper Association (NNA), an industry organization of 2,000 newspapers that he led for eight years. Earlier at the Missouri School of Journalism, Steffens was associate director of the New Directions for News (NDN), a leading industry think tank. Brian Steffens, a former executive director of the National Newspaper Association, discusses the status of small community newspapers. Brian Steffens, a former executive director of the National Newspaper Association, discusses profits and the future of small community newspapers.